“Brain Types and Parenting” is devoted to helping you know and understand your children and yourself more fully. By discovering your child’s inborn God-given design, you will understand why his or her mind works as it does – why children view matters and make decision as they do. 323 pp. – Now available! Finally available for the first time, Jon Niednagel has combined his research with recent scientific discoveries to produce a new series of educational publications. The first in the series, “Brain Types and Parenting” is devoted to helping you know and understand your children and yourself more fully. By discovering your child’s inborn God-given design, you will understand why his or her mind works as it does – why children view matters and make decision as they do. You will also better understand your child’s emotional makeup. Presented with the physical and athletic perspective, you will know what your child’s body is capable of doing, and to what degree, while socially, you will better understand why your children tend to regard others as they do. This book also comes packed with all of Jon Niednagel’s latest Brain Type information, including the new lettering (FCIR / ENTP, etc. ), the new numbering (#13 FCIR), the 4 Brain Type Quadrants (Q1, Q2, etc. ), and the newly designated “Dove” and “Hawk.” This book is a MUST HAVE for all Brain Type enthusiasts! 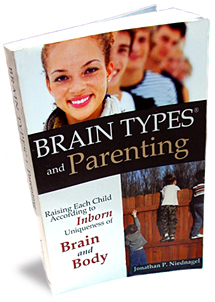 Be the first to review “Brain Types and Parenting” Click here to cancel reply.